GENEVA (Reuters) - Bahrain accused Shi'ite Iran on Thursday of fomenting deadly violence in the kingdom, and a Tehran official accused the Sunni-ruled island state of torturing and imprisoning its critics. The clash at the U.N. Human Rights Council came after three policemen were killed on Monday by a bomb at a protest in Daih, west of the capital Manama, during a procession of mourners for a Shi'ite Muslim who died in custody last week. 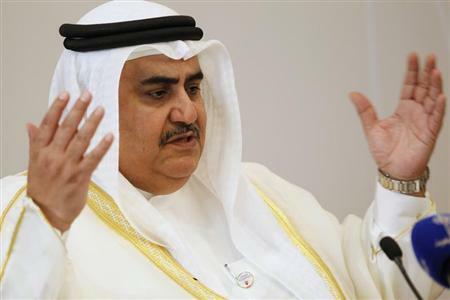 Bahrain blacklisted three anti-government groups as terrorist organizations on Tuesday. The attack has raised fears of more violence in the Sunni Muslim-ruled kingdom, where opposition groups led by majority Shi'ites have staged protests for three years demanding political reform and an end to perceived discrimination. The shadowy Saraya al-Ashtar organization has claimed responsibility for the attack in a message on social media. Khalifa called on Iran to "respect the principles of non-intervention, peaceful coexistence and good neighborliness enshrined in the U.N. Charter".